The Island Inn, built in 1816, is a 32-room hotel with a restaurant on Monhegan Island, 14 miles off the coast of Maine. The two-mile-long, half-mile-wide island, with its craggy coastline, has long been a favorite subject for artists. Edward Hopper, Rockwell Kent, and Andrew Wyeth all painted the island. For $4.3 million, the buyer gets seven buildings on three parcels of land that add up to 1.27 acres. In addition to the 26-room main hotel building, the property includes a six-bedroom guest cottage. The other buildings include a gift shop and coffee shop, staff dormitories, a workshop, a warehouse, and the innkeeper's residence. The restaurant, housed in the main building, seats 80. The season runs from May to early October, and room prices range from $130 to $395 a night. About 60 percent of revenue comes from lodging, 25 percent from restaurant sales, and the final 15 percent from the gift shop. The inn is served by three scheduled ferry routes. The inn's owners, New Yorkers Philip Truelove and Howard Weilbacker, bought the property in 1996. They employ a couple who run the hotel and a caretaker who lives on the island year round. Truelove says that once his and Weilbacker's daughter reached school age, traveling to and from Maine became too time consuming. Price Rationale: The $4.3 million price, at 12 times 2007 earnings, is based largely on the value of the real estate rather than on that of the hotel business. 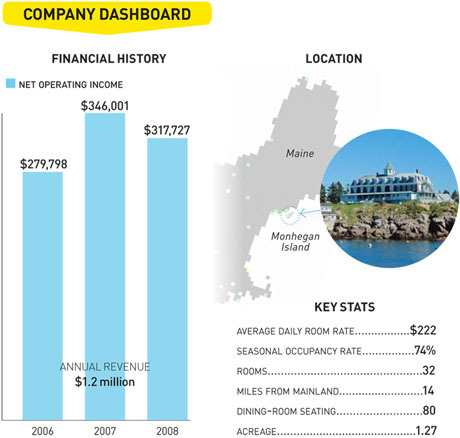 The Pros: The island has long been a popular summer destination, and the inn is consistently profitable. Three-quarters of the island is uninhabited and protected by a private trust, making further development all but impossible and giving the inn a near monopoly on the island's hotel business. The Cons: Operating revenue is unlikely to cover monthly expenses unless the buyer's equity investment is more than 30 percent of the purchase price, says Anja Bernier, president of Efficient Evolutions in Newton, Massachusetts. Harsh winter weather requires constant capital investment to maintain the facility. The Bottom Line: Given the inn's limited growth potential, prospective buyers should view the inn as a real estate investment "that happens to come with a business and not the other way around," says Bernier. Inc. has no stake in the sale of the business featured. The magazine does not certify the accuracy of financial or other information provided by the seller. Inquiries should be directed to Rick Wolf at the B&B Team at rick@bbteam.com or 207-967-1995. Inc. also publishes paid business listings in the back of the magazine.